No. 1 Baylor women beat No. 20 Iowa State for Big 12 title. 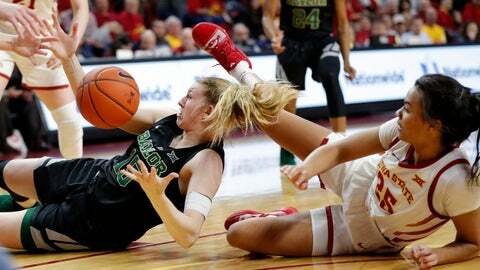 AMES, Iowa (AP) — Chloe Jackson scored 18 points, Juicy Landrum had 16 and top-ranked Baylor never trailed in beating No. 20 Iowa State 73-60 on Saturday to clinch the outright Big 12 title. Kalani Brown added 14 points and seven rebounds for the Lady Bears (25-1, 15-0 Big 12). They won their 17th straight game and improved to 6-1 against ranked teams. Iowa State gave Baylor something of a late scare, using a 14-2 run to pull to 65-56 with just under five minutes to go. But Landrum drilled a 3 to push the lead back to 12, and the Bears held Iowa State scoreless for over three minutes. Bridget Carleton had 28 points and eight rebounds for Iowa State (20-7, 10-5). SAN FRANCISCO (AP) — Chandler Smith scored 14 points, Zykera Rice added 12 and Gonzaga handed San Francisco its seventh straight loss. Jill Townsend added 10 points for the Bulldogs (25-3, 14-2). Shannon Powell had 20 points for the Dons (6-21, 2-14). AUSTIN, Texas (AP) — Joyner Holmes scored 16 of her 20 points in a dominant first half for Texas. Danni Williams added 16 points for the Longhorns (21-6, 11-4 Big 12). Chrislyn Carr led the Red Raiders (12-14, 3-12) with 19 points. DENTON, Texas (AP) — Nancy Mulkey scored 18 of her 24 points in the second half and Rice celebrated its first Top 25 ranking by clinching the Conference USA title and winning its 16th straight game. Mulkey made 10 of 15 shots, going 8 of 12 in the second half for the Owls (23-3, 14-0). Terriell Bradley led North Texas (14-12, 7-7) with 10 points.